CSC and UON have an agreement to jointly support candidates from the People’s Republic of China to undertake a PhD at the University of Newcastle. Upon successful completion, students enrolled under this scheme will receive a PhD from the University of Newcastle. 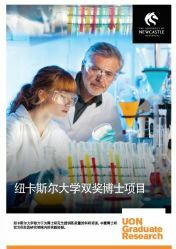 In addition UON may also accept students from Chinese university partner institutions as part of the Visiting Postgraduate Research Students scheme. 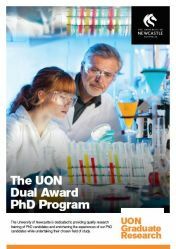 Students under this scheme may be considered for admission into a Dual Award program and receive their PhD from both the University of Newcastle and their home university in China. CSC candidates are highly valued by the University and recognised as being high achievers. We encourage applications from candidates in all areas of study – we offer PhD programs in over 80 disciplines. The University of Newcastle (UON) is ranked 214th in the world, according to the 2019 QS World University Rankings. UON is a research-intensive university which has a vibrant research culture and registers on the global stage through collaboration with research peers, industry, government and the community. Our research centres bring together our top researchers and promote cross-faculty and cross-disciplinary research to achieve research outcomes that have significant impact on society - nationally and internationally. Please watch our Youku videos for more information about Newcastle and the University of Newcastle. The University of Newcastle offers a supportive environment for students to undertake their PhD. We understand that PhD students need to dedicate their time to their studies and are ideally not distracted by any additional financial burden. With this in mind, CSC will provide each student selected under this program with a living allowance for the term of the scholarship, a return airfare to Australia, visa application fees, and the cost of the Australian Government approved Overseas Student Health Cover. Living allowance top ups from the University of Newcastle may also be available. Please see the Future Students Resources page for more information on resources available to all University of Newcastle Higher Degree by Research students. The University of Newcastle has developed a code specifically for all China Scholarship Council applicants wishing to study with us. Applicants are requested to enter the 'Pre-identified candidate code' when submitting their online application. This code will enable us to quickly identify China Scholarship Council applications and ensure that these are prioritised and supported throughout the application process. Applicants wishing to study with the University of Newcastle can expect to receive a prompt outcome regarding their application. When completing your application, please ensure to include the code: CSC2019 in the 'Pre-identified candidate code' field, which can be found at the top of the 'Supporting Documentation' page as shown below. The University assesses all applications on a case-by-case basis. For international students, completion of a four year bachelor degree with a high GPA is the standard entry requirement. Additional postgraduate research training such as a Masters degree with a significant research component is also highly regarded. In addition to academic eligibility, offers of admission are made dependent upon there being appropriate supervisory capacity to oversee the proposed research. Applicants are required to demonstrate meeting the University's English proficiency policy. The most common method of meeting this is an IELTS (Academic) score of 6.5 overall and no subtest below 6.0 (for PhD programs in the the School of Health Sciences, the School of Nursing and Midwifery or the School of Medicine and Public Health the overall IELTS (Academic) score required is 7.0 with no subtest below 6.5). You must be a citizen and permanent resident of the People's Republic of China at the time of application and not be working or studying abroad. You will require an offer of admission from the University of Newcastle before you apply to the CSC for a scholarship. Students successful for a CSC visiting scholar scholarship, that allows them to spend 12 months or more at the University of Newcastle, may consider applying for a Dual Awarded Doctoral Degree. UON’s Dual Award PhD program enables the CSC visiting scholar to complete their PhD degree jointly at UON and at their current Chinese University, and receive recognition for such on their degree testamurs. The Dual Award PhD is governed by an individual agreement for each candidate. The PhD candidate receives two testamurs, one from each university with each acknowledging that the degree was undertaken as part of a dual award program with the partner university. Dual Award degrees can be undertaken in any discipline where there are suitable supervisors available at both UON and the partner institution. You may discuss the possibility of enrolling in a Dual Award Doctoral Degree with your nominated supervisor at UON. For more information on Dual Award Doctoral Degree programs for CSC visiting scholars please email hdr-partnerships@newcastle.edu.au. Students from anywhere in the world are eligible to apply for University of Newcastle International Scholarships. More information on these opportunities is available on our scholarships webpage. The University of Newcastle offers all applicants an opportunity to enhance their application and increase the chances of being successful for a scholarship. Please read our Applicant Information Sheet for more information on how to enhance your scholarship application. The University of Newcastle is continually ranked amongst the top universities in the world. Discuss your ideas with a potential supervisor at the University of Newcastle. Search for supervisors in your area of interest. Think about your research topic. Our research proposal template may be useful as a guide. Please include "CSC2019" at the pre-identified candidate code question so that we can fast track your application. When we receive your online application with copies of your academic transcripts and certificates, our admissions team along with professors in your area of research will assess your academic background to make sure that you have the appropriate background for your intended course of study. It is possible that you might be asked to do additional courses alongside your PhD to supplement your prior learning. Once your application for admission is approved, the University of Newcastle will send you an Offer of Admission letter by the 1st of March 2019. Incomplete applications, or applications received after the 31st of January 2019, may not be receive an outcome until after the 1st of March 2019. An application for a CSC scholarship, along with your University of Newcastle Offer of Admission, will need to be submitted to the CSC approximately between 20 March 2019 and 5 April 2019. Some applicants may need to undertake a separate application process with their Chinese home institution. If your home institution requires you to have an Offer of Admission before the 1st of March 2019, please let us know and submit your application for admission to the University of Newcastle six weeks before your home institution's deadline. Once you have met the conditions of your University of Newcastle offer you will receive a Confirmation of Enrolment (CoE) that you can use for your visa application. To apply for a student visa (subclass 500) before traveling to Australia, please visit the Australian Department of Home Affairs website. Please be aware that an Offer of Admission at the University does not guarantee that you will be granted a student visa. For information and assistance on visa requirements and application processes, please visit our Visa and Immigration webpage. The student visa (subclass 500) allows eligible family members to accompany you to Australia for the duration of your course of study and allows both you and your family members to work for a specified number of hours. Please be aware that it can take 2-3 months (or sometimes longer) for a visa application to be processed. We look forward to welcoming you to Newcastle.